I confess. I’m that annoying person that likes to take pictures of my food at restaurants. I make people wait to eat because I need to get a good photo before the food is touched. I rearrange the food dishes on the table so they look Instagram worthy. I guess if you are one of my good friends, than this isn’t such a surprise for you. A few of my amazing co-workers like to push me to try new challenges, like training for a half-marathon in Angkor Wat (please don’t make me sign up for a marathon) last year, and this year, something a bit more reasonable, but I was still so hesitant. There are a group of teachers at my school that organize this group of “sketchers”, and it’s a pretty creative idea. Everyone in the group gets a blank sketchbook. 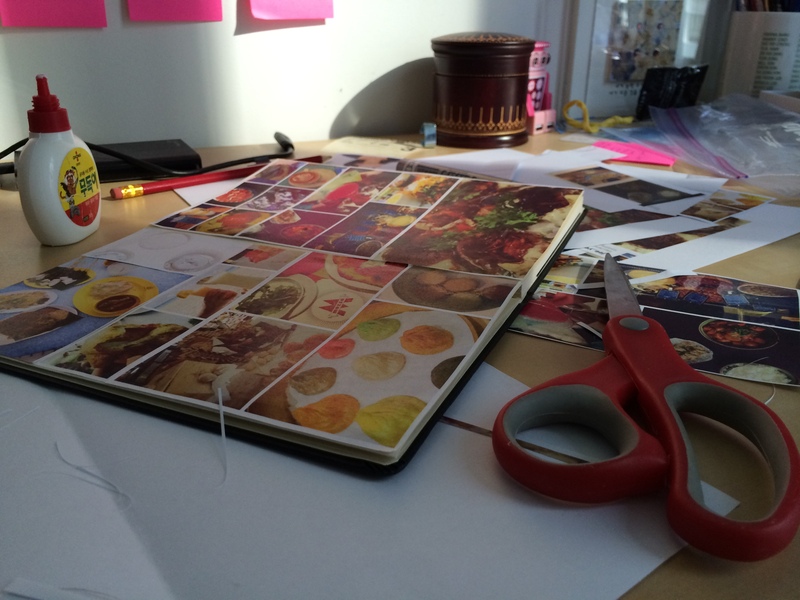 Each person in the group comes up with a theme for their sketchbook. They decorate the first page of their sketchbook following their theme. Then, they pass it to the next person on the list. After a month, they pass it to the next person. At the end of the year, you receive your sketchbook back, filled with different sketches from different people. They each create something based on your theme. I was super hesitant to join, because I didn’t want to add one more responsibility to my plate. So, I told them I wasn’t going to. Then, the day before the deadline to sign up, Leigh came to me and asked me if I had signed up yet. She assured me that it was pretty low key, and that if you miss a month it would be ok. I needed to hear that. So of course in the end I decided to sign up. After quite a few days of reflection, list writing, and going back and forth, I finally came up with my theme for the year. Earlier on, Leigh suggested I do something about food (she knows me so well). And, then it came to me. Life is delicious. 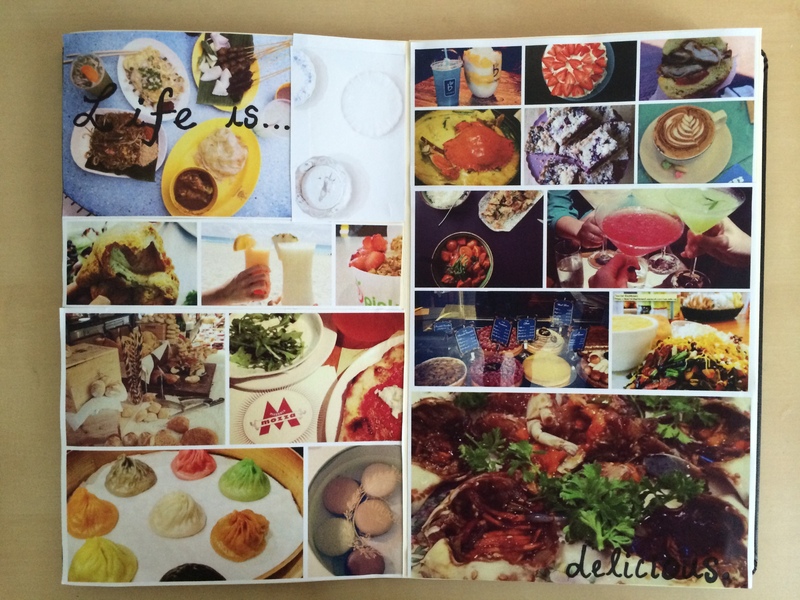 I was also inspired by a hashtag that lady ironchef started, #LifeisdeliciousinSingapore. And, yes, it’s true. Food is abundant,glorious, and delicious here. For me, this theme isn’t just about food, but it’s about the stories behind the food. It’s about the recipes that are passed on through the generations. It’s about the comfort and feeling of home food can bring. It’s about the people I shared those meals with. It’s about the stories, laughter, and tears, that were shared while eating. So I started to get crafty as the first deadline of passing on our notebook arrived. I ended up creating a collage using photos I took mostly on my iPhone and photos I posted on my Instagram. Here’s what happened over an early Sunday morning. Now I need to start taking pictures of the theme I got for this month from another teacher’s sketchbook, “tangled”. I always have a hard time coming up with things like my favorite movie or book, because it’s really hard for me to come up with only a few. There are so many books outside this list that have changed my life in small and big ways, like the Bible. There are so many books that I’ve fallen in love with. There are so many books that I laughed, cringed, cried, smiled and traveled through. So, that’s my long way of stating that this is not a comprehensive list, but a starting point of 10 books that have changed my life in ways, that I actually remember reading them. 1. 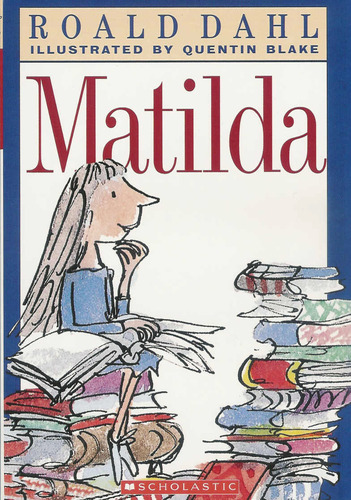 Matilda by Roald Dahl- I read every single Roald Dahl book I could get my hands on as a kid. I loved all of his books. Matilda was probably my favorite and then Charlie and the Chocolate Factory coming in at a close second. I loved Matilda as the protagonist. 2. 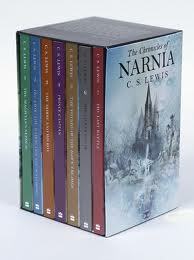 The Chronicles of Narnia by C.S. Lewis- I remember reading this series as a kid, and falling into the fantasy world as they traveled into the magical wardrobe to Narnia. I remember wondering what Turkish Delight would taste like. I’m glad the movies came out way after my childhood days. 3. The Diary of a Young Girl by Anne Frank- Last year, I was able to visit the actual house that Anne Frank stayed in and walk up the hidden staircase into the rooms that her family hid in. It was a surreal and unforgettable moment. 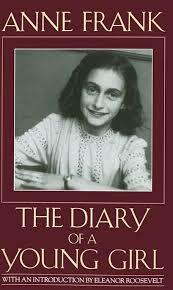 I remember seeing pages of her actual diary in the museum. I’ll always remember reading this book as a teenager and just imagining what life must have been like for her. The words of this teenager during the Holocaust resonated in my soul. 4. The Little Prince by Antoine de Saint Exupery- This book, the French version, that my father gave me, or I might have just “taken” his copy, has special meaning for me. Not only is it a story that I can read over and over again, I love that it’s the book that my father read, when he was studying French. There aren’t many books that my father kept over time and aren’t in Korean. 5. Interpreter of Maladies by Jhumpa Lahiri- Not only is Jhumpa Lahiri a Barnard alum, she has become one of my favorite authors. This was the first book I read of hers, and I can’t help but enjoy all the books that she writes. Even though her characters are usually Indian Americans, I can always relate to her characters, their struggles, and their journey. She is an incredible writer and I will continue to be a huge fan. 6. Three Cups of Tea by Greg Mortenson- I remember after reading this book, I felt like I could change the world through education. I started to dream about building my own schools. Maybe I didn’t have to go all the way to Afghanistan to do it, but it stirred me deep within. 7. Teacher Man: A Memoir by Frank McCourt- I had to put at least 1 teacher book on this list. And, this would be the most appropriate one. I remember reading this while being a NYC public school teacher. If you are a teacher, read this book! 8. Nothing to Envy: Ordinary Lives in North Korea by Barbara Demick- I think reading books about North Korea are so incredibly fascinating and eye-opening. This book that follows the lives of a few different N.Korean refugees are heartbreaking and makes me pray, that change will come to N. Korea sooner than later. 9. Cold Tangerines: Celebrating the Extraordinary Nature of Everyday Life by Shauna Niequist- I love her honest and raw collection of short stories/essays. She makes me laugh, she makes me reflect, and she challenges me. I could totally imagine writing a book in this style one day. I want to be her friend. 10. Wild by Cheryl Strayed- This is the most recent book that I’ve read that is on my list. I wasn’t necessarily blown away by the writing, but something about Cheryl deciding to hike the PCT all by herself after going through a difficult times was pretty inspiring. It did make me want to go hiking, but more importantly it challenged me. It challenged me to continue to try the impossible and that failure, can only help you on your journey. So, if I decide to climb the Himalayans next year, don’t be surprised. Just kidding…I think I’ll start small with climbing Mt. Kinabalu. I now tag Melody, Petrina, Brian, Dyanne, Sharon & Tammi to share with us their top 10 books because I know you all love to read!